Casa Theresa is a cosy holiday house that you will have entirely to yourself. It is situated directly on a stream in a quiet setting in the centre of Achenkirch, an idyllic holiday destination, close to Lake Achen. 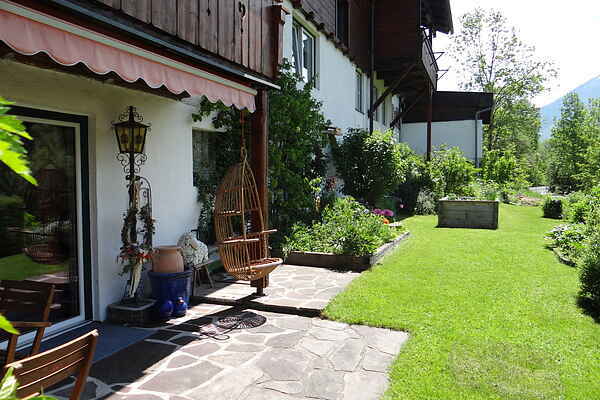 This relaxing holiday house offers a cosy and romantic ambience in the Tyrolean style and is spread across 3 levels. It is very comfortably furnished with an eye for detail and has three cosy bedrooms, a well-equipped kitchen, dining room, living room, FREE wood sauna, bathroom, terrace and an enclosed balcony/conservatory (for smokers), as well as satellite TV and W-LAN. You will feel like you're living in a castle. Surrounded by mountain scenery and natural beauty, this is the place to go for a pleasant holiday. The Christlumlifte ski area and lovely cross-country ski trails are located quite close by. In summer and autumn this makes an ideal base for beautiful hikes and bike rides, or you can spend the day in a sun lounger in the garden right next to the stream, where you can also go for a refreshing dip. You can be at Lake Achen in just 5 minutes to enjoy its many leisure opportunities.